This is the first installment of the Studio STEAM-up Series! Each week we will explore arts integrated lessons connecting dance to the STEAM subjects. This week is Science and Dance! HS-LS1.1: Demonstrate understanding by completing a task such as: construct an explanation based on evidence for how the structure of DNA determines the structure of proteins which carry out the essential functions of life through systems of specialized cells (HS-LS1.1). The Arkansas state standard is a little more surface level with an expectation of identification. However, the Next Generation standard is a little higher in depth of knowledge, requesting a major task in construction. So, it is assumed that the students are already in a place where they are able to demonstrate the understanding of the systems fundamental makeup. In other words, they are able to identify the parts of various systems. With that said, some of the lessons presented here today have a direct link to the Next Generation Science standards, while others provide a foundational level of support to be used when preparing students to attack the new standards. I have found that the most useful tool is fellow teachers. My best lessons have come as a result of collaboration with educators of other subjects. We will be using the Next Generation Science standards for high school and the National Coalition for Core Arts Standards for Dance. Almost any science concept can be used as springboard for dance composition. Anything from chemical reactions to space systems can be used as stimuli for creating movement material. The best part is, by getting students up and moving the content will be retained and recalled in greater detail as their muscle memory kicks into high gear! This is one of those areas where there is not a concrete Next Gen standard however, students must have the foundational knowledge in order to demonstrate proficiency of the Next Gen standards. When introducing the systems of the body, why not use the body? Assess students ability to identify various parts of the skeletal or muscular systems by initiating movement. With all students standing, call out a section of the system (scapula, bicep, femur, gastrocnemius) students must initiate movement by moving that particular part. Continue adding to their movement phrases by calling out new parts. This will allow students to memorize parts of the body through movement. This can also be done as an across the floor component. Have students begin on one side of the room and move across the floor leading with the section of the body you call out. This can also be done in partners. Have one partner initiate movement by touch and the other move that section of the body creating a movement phrase. 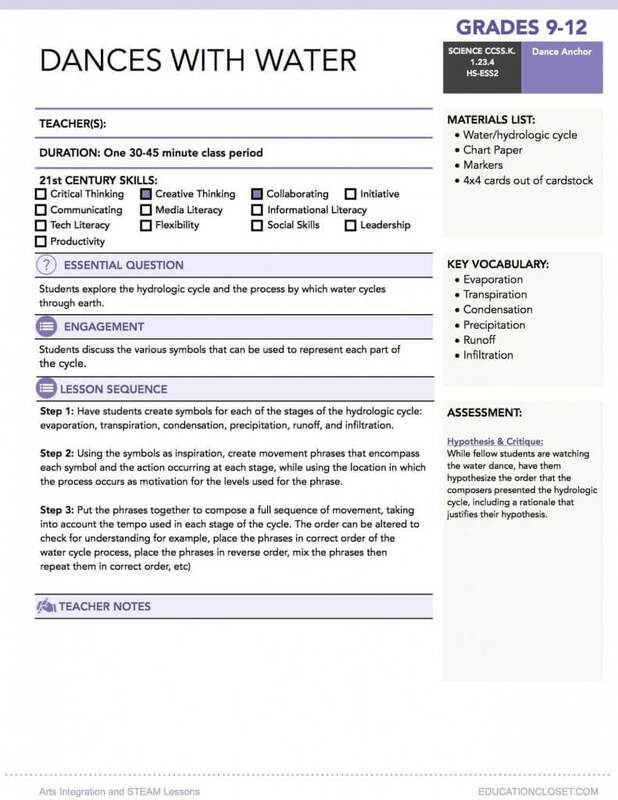 You can have students annotate their phrase by writing down the skeletal or muscular parts they plan to use, and then build a phrase by initiating movement from each of the parts. You can assess their understanding by following their written annotations while watching their movement phrases. 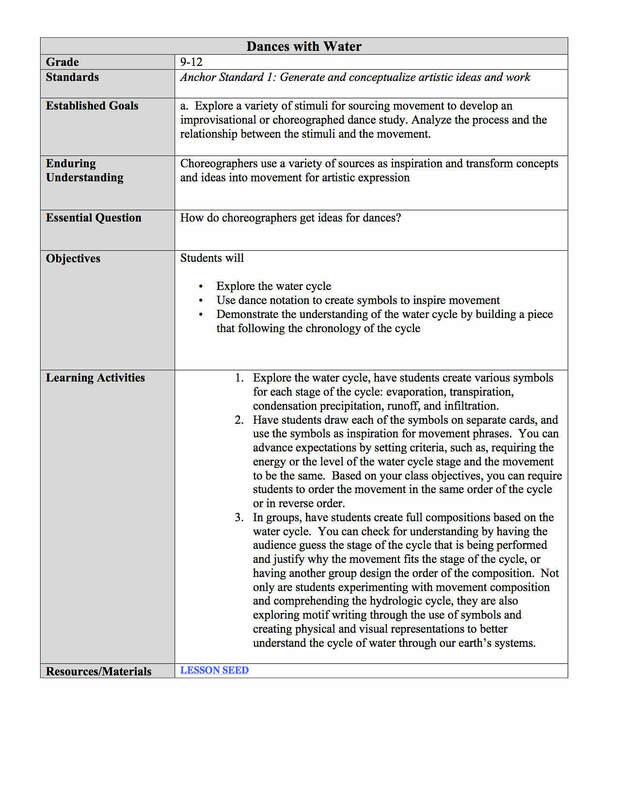 The following is a lesson plan created in partnership with a science teacher. Just about any scientific concept can be explained through movement of the body. Try integrating movement into your science courses! If you have a science lesson you would like to integrate with dance, or if you try one of these here please drop me a comment below or email me at [email protected], I would love to hear about it!